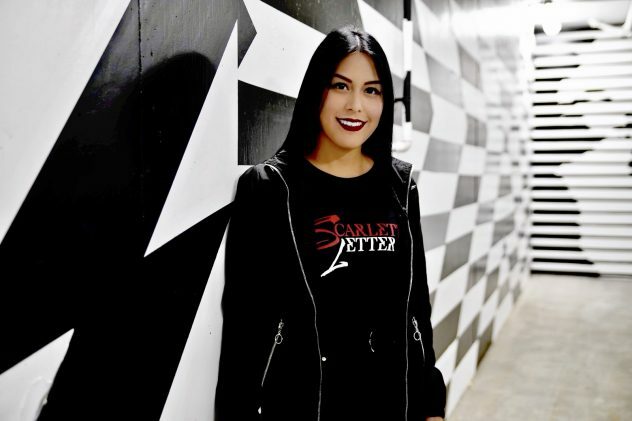 Fluttering between three jobs, classrooms, the KCR studio and the rave scene, Scarlett Santamaria of “Scarlett Letter” is a social butterfly always on the move. Scarlett, a 4th year communications major, is the host of the aptly named “Scarlett Letter,” an underground electronic music show that brings in guests to share their music and their stories. The show is now on its second season and airs Thursdays at 8 p.m.
Scarlett Letter brings in DJs, producers and experience creators every week to play their music mixes and discuss their own personal experiences, as well as contribute to the larger dialogue about the EDM world. The topic of the show is not a casual interest of Scarlett’s – it’s pretty much her life. 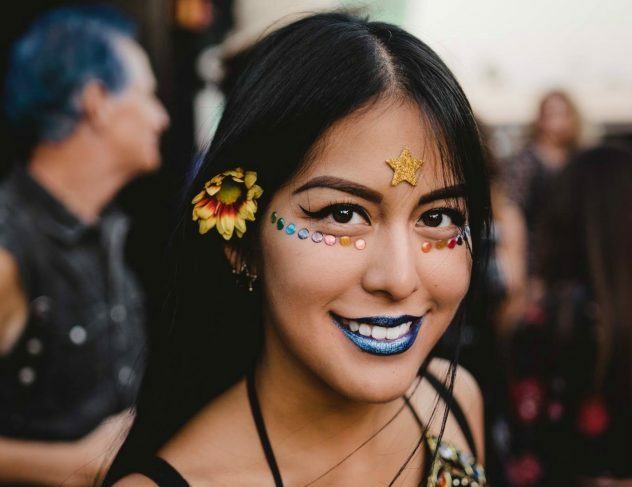 It all began when Scarlett was 16 and attended her first rave, Scream, at the Worldbeat Center in Balboa Park, San Diego. “I remember going in and everyone was really happy and really nice, and all these lights and the music and I thought, ‘Wow. This is amazing,’” she recalled. Born and raised in Tijuana, Mexico, Scarlett moved to San Diego when she was 12 years old. Despite her bubbly nature and willingness to talk to anyone, she said she always felt like an outsider. That feeling could have left her defeated and stripped of passion, but she discovered the rave scene and found her home. The goal of Scarlett’s show is to allow listeners to get to know the guests on a deeper and more personal level, uncover electronic music they might not have heard before, stay up to date with upcoming EDM events and learn about the music scene from people living it, not from stereotypes. Last semester, her show was structured in a way that allotted more time to playing the guests’ music than interviewing them. This is something Scarlett wants to change this season. She wants to make sure the people she brings to the studio have sufficient time to talk about their journey, passion and the obstacles they have had to overcome in order to get to their current status. Scarlett’s own story has its origins in DJing. Her father was a popular DJ in Tijuana, Mexico and San Diego, California. When she was born, he shifted his focus to parenting and leading a more conventional adult life in order to provide for her. “Of course, I happened and he stopped,” Scarlett laughed. Eight years ago, he began to DJ again and this time, he taught Scarlett everything he knew. The two had a mobile DJing business together but after feeling like she was ready to branch out, Scarlett started her own business entity separate from her father’s. She has played many gigs from private birthday parties to Petco Park, the San Diego Padres’ baseball stadium. She said she has enjoyed the experience, both the technical and social aspects. Despite calling the experience “really fun,” Scarlett has shifted gears and no longer focuses on her DJ business. She is turning her attention to new ventures such as Scarlett Letter and getting involved in event production. With so many interests and projects, Scarlett pays extra attention to detail to make sure she is producing work of the highest caliber. Scarlett Letter has grown into something beyond her imagination. What she thought would just be a fun show to act as a platform for her friends’ art has turned into a partnership with sponsors. Techniche is one of Scarlett’s partnerships and describes itself on its website as “a Southern California underground dance institution with global reach and universal aspirations representing Tech-House and Techno…” DJ and Producer Myxzlplix headed the Techniche team that helped Scarlett with her show’s logo, banner and promotional pictures, to name a few things. She said she’s incredibly grateful to them for believing in her and helping her turn her show into what it has become. Be sure to tune into her show on Thursdays at 8 p.m. She’ll save a spot for you on the dance floor. Also, be sure to check out her YouTube channel. Is she a pineapple on pizza gal? Although Halloween has passed, it was most definitely a NGHTMRE before XMAS at the Observatory North Park. The American EDM DJ/producer NGHTMRE, made his anticipated NGHTMRE before Xmas tour stop in San Diego the Wednesday before Thanksgiving, bringing a crowd of headbangers to break their necks to the electrifying drum and bass, trap, bass house and dubstep bass lines. He definitely brought the atmosphere to the crowd with the LED panels behind him displaying his zombie, pumpkin head skeleton and demon visuals, the synchronized lights and strobes flashing right in front of your face and even the vibe he would put out either by talking into the mic, or just him moving and dancing to his own music. As all other DJs/producers, NGHTMRE had some in developments (IDs) that he teased the crowd with. One that stood out was his surprising collaboration with A$AP Ferg. Although he completely stopped the music and brought the room to a blackout to announce the collab, Ferg’s voice is definitely one you cannot mistaken. As he starts playing the track, you start hearing Ferg rap over the beat and into the buildup, adding to the intensity when all of a sudden, the beat drops. Right away, you realize the utter filth of bass, brass and synthesizers that was just unleashed to your eardrums; filth that you want to be released already but probably will not happen until another six months from now (EDM DJ/producers take a long time to release their work). Overall, NGHTMRE did not disappoint and brought some light to the souls of the undead and told his story of the NGHMTRE before XMAS. Thursday night before Spring Break I traveled to the KCR studio to meet up with Michael Maverick. It was a couple minutes before 10 o’ clock, which is when he had his show. We said hi and chatted for a short while and once it was time for him to hit the air, Michael let his mix fly and we were able to sit down and have our interview. Cameron Satterlee: Alright so I’m sitting down in the KCR studio with Michael Maverick, thanks for sitting down with me, man. CS: Alright so, easy question for you here, tell us your radio slot. MM: Ten to eleven p.m. every Thursday. CS: Every Thursday, and you said earlier Thursday nights are Thirsty Thursday? MM: Thirsty Thursday mix, that’s right. CS: Alright, and so what do you play for the Thirsty Thursday mix? MM: I do Top 40, EDM, try to mix it up a little bit. Every now and then, throw in a little of that Throwback Thursday. Just mix it up, keep it fresh. CS: And so how long have you been with KCR? MM: I was here last semester and now this semester so I’m going for one year, two semesters. CS: Alright cool. Well welcome, it’s always great to have I guess sort of new DJ’s. You’ve had a semester under your belt so you know all the trick so far. CS: So I guess, it’s sort of popular music with the top 40, but with the throwbacks and the electronic music, EDM, you got this whole kinda scene behind that. What makes you want to play music from this group of genres? MM: Sort of mixing it up? MM: It’s just this evolution of music. Electronic music is really going into the mainstream. Not in a bad way, but in a way that it’s a mixture. A lot of hip hop is picking up EDM and a lot of EDM is picking up hip hop and it’s kinda fusing. So it’s only right to pay due diligence and say “okay they comes with this background and hip hop comes with this background” so when you play it you know what’s going on. CS: Oh yeah totally. I think you hit the nail right on the head there. EDM and hip hop are fusing to form this really popular music right now. But with your throwbacks, what do you play for that? Any other genres? MM: I can go from R&B to super old 80’s roller blading songs like that kinda old. I don’t think I would go beyond the 80’s. Yeah 80’s or 90’s. CS: Yeah so you’re basically sticking to the roots of EDM and hip hop. CS: Well that’s a good theme I guess. MM: It’s just how I grew up. My community, every day, friends, family. Hip hop is a culture and it is the culture that embraced me, you know? And EDM is kinda just barely getting into it cause at the club you could only play hip hop so much. You gotta play the EDM too, you gotta dance. So it’s kinda that give and take of both genres. But as for getting into it, it’s just environment. Environment and content, how back in the day it was really about having a voice and rap music did that and allowed people to express themselves when they didn’t have that opportunity to do so and that’s what made it attractive. CS: Alright cool, well thanks that was a great answer. So as a Top 40, EDM, rap guy, you got your ear to the ground. You know what’s hot right now, I guess more than most of the people I interview. So what is the big hot song right now that you’ve been just really wanting to play lately? MM: There is this song that I’m pretty sure is gonna be a summer hit. The song is by Eric Bellinger and I think it’s called Focused On You. It’s a sample of an older song and it’s got Two Chainz on it. And I think in the summer if it get a lot of play on the radio it’s gonna be a hit. CS: It’s gonna be a big club party jam or something? CS: Alright, so last question. I always like to end on this one, it’s a fun one. So you’ve got your one hour of Thirsty Thursday, how would your perfect show go? MM: My perfect show. Mix it all up. If I could get a good amount of hip hop, a good amount of EDM, and a good amount of throwback and rap, and fresh songs that just came out and kinda put them out there and make someone say “hey I never heard that song before and I like it” then I did a good job. CS: A little old, a little new, but all good? CS: Alright, well thanks, man. And with that I left Michael to do his show. 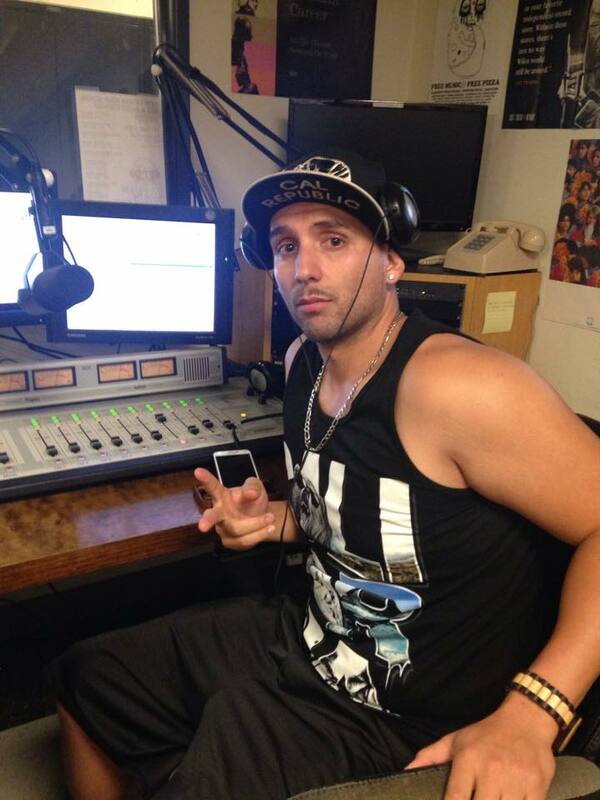 It’s great to hear our DJ’s be so passionate about the music they love, for Michael it goes back to his roots. He’s jamming out past dark on Thirsty Thursday, like a true college radio DJ. Make sure to tune in to his show, 10-11 p.m. only on KCR Radio, the Sound of State. It was a sunny Friday morning in March when I sat down with Jasmine and Nathan for the latest edition of The Sounds of State. I met Jasmine outside the studio and we talked for a few minutes before being joined by her cohost. This was one of the longest interviews I’ve ever done for the KCR blog, so I’m just going to let the two of them speak for themselves. I’m sure you’ll be as impressed with their passion and dedication to their show and with KCR as I was. Cameron Satterlee: Alright I am sitting down with Jasmine and Nathan on this beautiful Friday morning, welcome. So let’s begin by having you guys say your radio slot and if you have any DJ names. Jasmine Ho: Well our show is called Sunset Vibrations and we’re on every Wednesday night from 9 to 10, and I’m known as Jazzy-Fe. Nathan Yick: And I’m known as Yick. CS: I guess you already told me earlier Jasmine, but how long have the both of you been with KCR? JH: Well I’m a freshman so I started first semester of this year. NY: Yeah same here, but last semester we had different shows. Last semester I had a talk show before I got into DJing with Jasmine. It was pretty interesting going through that transition, but I definitely like DJing better. I don’t know, it’s easier you know? Last semester for my talk show I’d always find myself and my cohost improving the whole thing because you never had a set strategy. Cause it’s really hard coming up with an hour’s worth of content for just talking. CS: Oh I know what you mean. Yeah DJing is a lot easier and it can be a lot more fun. So what kind of music do you play? 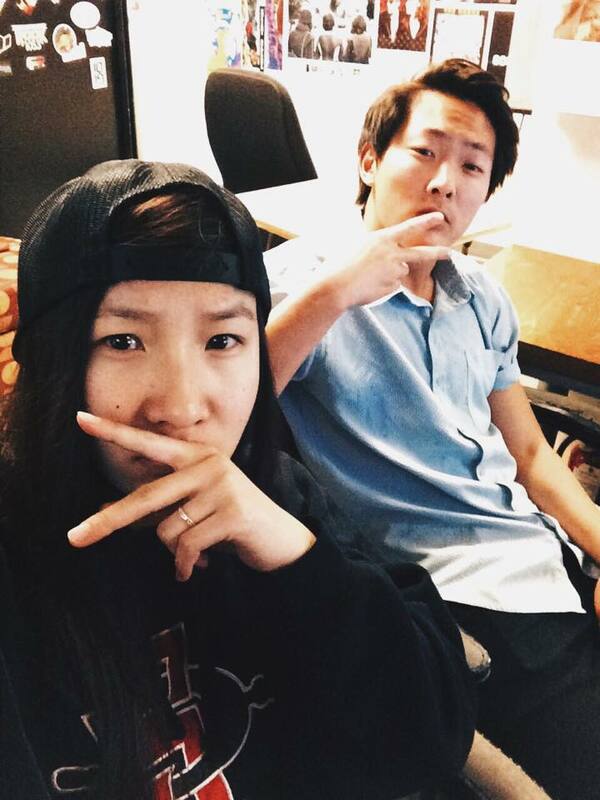 NY: We play electronic music but I guess me and Jasmine determined it was more alternative. JH: It’s kind of chill, mellow, mid-tempo music. So not quite like EDM you’d hear at big raves. I mean first semester that’s what I’d play when I had a show with other people but this semester I wanted to change it up because I was kinda getting bored of mainstream electronic music. So yeah our show is really chill, I mean it’s called Sunset Vibrations so we try to find music that you’d want to listen to when watching sunsets or something. CS: Well you’ve got a whole theme going, that’s cool. JH: Really laid back and chill and relaxed. CS: Awesome. Yeah I really dig that stuff right now, but not that much of it. Maybe I should listen to your show! CS: So I guess you kind of answered this question already, but if you want to go deeper that’s also cool. So why did you get into this kind of music specifically? JH: Well I’ve always been into electronic music. I started out listening when I was in seventh grade and that progressed into me becoming a little raver in high school. At the time not a lot of my friends were into it, but I was so into it that I kind of converted all of my friends into liking EDM. JH: And then I’d go to raves with my friends and then now my taste in electronic music has progressed. I like new sounds which is why I like the genre we play because it’s really trendy right now. All the artists who are making music and in the genre are that we play, they use really new sounds. It sounds unlike anything I’ve heard before and that’s what I like about it. NY: The music we play is so unique, there’s no set trend, cause every song we play is so dynamic, so different. Because that’s the beauty of alternative EDM, but it still maintains that consistent theme of being chill and danceable yeah. JH: It’s still danceable and steady and rhythmic. NY: They use sounds that mainstream DJ’s don’t normally use, and they really explore the horizon of sounds across the board and it’s just really interesting because you never know what they’ll come up with next. JH: And I think what’s also great with the genre is that there’s so many new artists that are coming out, making music in this genre, every time I go on Soundcloud or something I discover somebody new. There seems to be no end to all the people who make it. I guess most of the music we play we would consider future—I think that’s what it’s called, I think people refer to it as future music, future bass, future chill. It’s kind of got really super electronic sounds and yeah there’s so many new artists that I’ve never heard before but they all make really good music and that’s what I like about it. We’re always discovering new people. CS: So you could go the entire semester without playing the same person twice? NY: Yeah, definitely. We’ve been doing that so far. JH: Yeah it’s been so diverse. CS: Wow. Alright so I guess this is sort of a related question but why is this music important to you? Or important to play in general? JH: I think it’s a step away from the really popular electro-house music that’s all over the radio nowadays. I feel like the electronic music that’s really popular right now is really repetitive and predictable. It’s like build up, drop, build up, drop. But with the music that we’ve been playing, they cater to a wide range of emotions. And that’s why I call it alternative, cause when you listen to alternative rock music it’s kind of like you can get a whole range of emotions like happy, uplifting songs to really sad songs. It’s the same way with the music that we play, not just party music. Music that you can actually enjoy just listening to on a daily basis. NY: Yeah pretty similar to her. I think with the stuff we play it’s a breath of fresh air. I feel like with the mainstream medium genre it’s really easy to get burnt out and get sick of the same drop. It’s pretty predictable you know? But with alternative EDM it’s like what Jasmine said, it caters to a whole wider range of emotions. You surprise yourself with the music, and then some songs, they’re so dynamic that it sounds like you’re listening to electronic for the first time. Every single week when we make our own mixes for our shows there have been moments where me and Jasmine have been like “woah this song is so good”. A new song each week. JH: Yeah if a song catches up off guard we’ll be like “woah that was really cool”, we totally did not see what the artist did there, we did not see that coming. NY: Yeah and then adding onto catering to different emotions, this music makes you feel a certain way. It puts you in certain settings and then we talk about on our show, some of the EDM we play really has Asian/oriental chime-y sounds, you just feel like you’re in Japan or something. So I think that’s really unique mainstream media doesn’t do a good job of doing. JH: Yeah our genre has a really diverse set of sounds. The artists are always inventing new computerized sounds to add into their songs. It’s a fun genre to listen to. CS: That’s cool. So I guess you already answered this question but I wonder if I can get any DJ names out from you. Is there anybody specifically that’s just awesome in your opinion? JH: I want to say that probably the most famous person that fits into our category is Flume, I think a lot of people know him. Um maybe Giraffage, he’s a big one. NY: Yeah those are pretty much the two top guys. JH: Honestly we listen to so many different artists it’s hard to pick out one. JH: But Flume, Giraffage, Glass Animals has been my favorite recently. NY: ODESZA has been pretty classic for alternative EDM. Djemba Djemba is pretty good, he’s been rising recently. I don’t know this music is just so unique. JH: Yeah that’s pretty good. NY: It’s funny because all these DJ’s are from what we would consider the same genre, but if you break down their music and compare technicalities it’s completely different. JH: Yeah with a lot of these artists it’s really hard to describe what their music even is like. You can’t place them in a category. CS: Alright thanks, I’ll ask you for some links later to put up. So you weren’t cohosts last year, what made you want to partner up? JH: Well last year Nathan was doing a totally different thing. I was doing music but he was doing a talk show. So our show categories weren’t really together. NY: Two different things yeah. JH: So I I ended up partnering up with people I had just met only through KCR and that was nice cause they were chill and it was fun, but when we have to start off partnering up with people we don’t know, I kind of realized that my tastes in music and what I wanted to play didn’t really line up with what my cohosts wanted to play on the air all the time. So I was like “I kinda want to make my show my own and I know Nathan has really similar music tastes as me” and we’ve been friends since middle school so I know he was a guy I’d want to have a show with. And it’s been working out really well. I really like all the music that we play. NY: I think that yeah that’s the big thing, I think we’re both lucky to have each other be on the same page with music tastes, so you can actually take the show seriously. And we have been actually this semester and it’s been really good. It’s been going pretty good. JH: Yeah I’ve definitely been doing a lot more work trying to publicize our show, getting us out there on social media and stuff. NY: I’m just excited to see where we go cause I feel like our show has so much potential. The genre has so much potential. JH: I feel like my first semester was my practice with it, to just see what having a show was like, figuring out exactly what I wanted to do. And then this semester I know what I want to do and we’ve been doing it. CS: Yeah, I mean you could probably even do a two hour show next semester. JH: I would. I was considering it for this semester but with school and work it’s hard to make time for it. One hour definitely does go by pretty quick but in the future when we have more time for it. NY: Yeah in the future when we have more time for it then definitely. CS: Alright, so how would a perfect show go for you? JH: My ideal show. I love the shows where we do giveaways, especially big giveaways. We recently just did a giveaway for CRSSD Festival and we had so many people calling in trying to win it. We try to be really smooth with our transitions, fading in and out of songs. I don’t know, our perfect show would have a really good playlist that flows and really flows well with emotions and sound after each other. And we always talk on our show, every one or two songs we’ll take a break or pause to tell everybody what we just played and what’s coming up next. If we have guests we’ll have a one or two minute convo with them in the middle. NY: Yeah to spice up the show. JH: Yeah we’d ask them about the music we’re playing and see what they think. NY: Offer a new perspective. NY: That was their time period to call in. JH: And the first one that called in got it. I don’t know why it’s so fun for us to do. We don’t know who’s gonna call in, they don’t know. We’re excited to make somebody a winner. NY: And then before the giveaway on last week’s show we hyped it up, told them about the song to look out for, and then we also made fliers too for the giveaway. JH: Yeah we made fliers and passed them out around campus to people walking. NY: It really paid off. We had a lot of callers. JH: Yeah usually we don’t expect that many people are listening but we had a surprising amount of callers. Not even when they were supposed to call, people we just calling in. There were probably a lot of people listening in. NY: Yeah and that was the most we’ve had, not gonna lie. So yeah I mean I guess that would be a perfect show. JH: If we had lots of listeners, people calling in. We put people on air too, maybe give a shout out, say a few words. Cause the last person we put on air really complemented our show and that was sweet. CS: Yeah well that sounds awesome. So I guess you’ve only been doing this show for a few weeks but sounds like you’ve all got it down. That’s awesome. Alright well thanks for joining me, this has been a great interview. I had to run back to get ready to head out to Mission Bay, so I couldn’t chat too long. Later on, they sent me files of their recorded shows so you can listen to them any time! Check out their mixes and be sure to check out their regular show Wednesday nights from 9-10, only on KCR radio, the Sound of State.